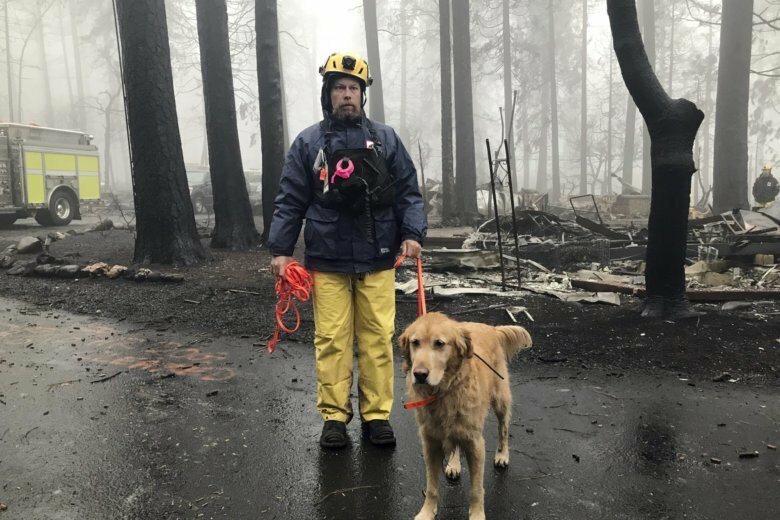 PARADISE, Calif. (AP) — The catastrophic wildfire in Northern California is nearly out after several days of rain, but searchers are still completing the meticulous task of combing through now-muddy ash and debris for signs of human remains. Crews resumed the grim work Saturday as rain cleared out of the devastated town of Paradise. Some were looking through destroyed neighborhoods for a second time as hundreds of people remain unaccounted for. They were searching for telltale fragments or bone or anything that looks like a pile of cremated ashes. The nation’s deadliest wildfire in a century has killed at least 84 people, and 475 are on a list of those reported missing. The flames ignited Nov. 8 in the parched Sierra Nevada foothills and quickly spread across 240 square miles (620 square kilometers), destroying most of Paradise in a day. The fire burned down nearly 19,000 buildings, most of them homes, and displaced thousands of people, the California Department of Forestry and Fire Protection said. The two-week firefight got a boost Wednesday from the first significant storm to hit California. It dropped an estimated 7 inches (18 centimeters) of rain over the burn area over a three-day period without causing significant mudslides, said Hannah Chandler-Cooley of the National Weather Service. The rain helped extinguish hotspots in smoldering areas, and containment increased to 95 percent. Despite the inclement weather, more than 800 volunteers kept searching for remains. Crews worked on-and-off amid a downpour Friday. While the rain made everybody colder and wetter, they kept the mission in mind, said Chris Stevens, a search volunteer who wore five layers of clothing to keep warm. His search crew went home to Orange County on Saturday after completing its assignment. Authorities also lifted evacuation orders for certain sections of Paradise. In Southern California, more residents have returned to areas evacuated in a destructive fire as crews repaired power, telephone and gas utilities. Los Angeles County sheriff’s officials said they were in the last phase of repopulating Malibu and unincorporated areas of the county. At the height of the fire, 250,000 fled their homes. Flames erupted Nov. 8 just west of Los Angeles and burned through suburban communities and wilderness parklands to the ocean. Three people died, and 1,643 buildings, most of them homes, were destroyed, officials said. Associated Press journalists Olga Rodriguez and Daisy Nguyen in San Francisco and John Antczak in Los Angeles contributed.